Tashkent’s opera house, named in honour of the the great 15th century Uzbek poet and scientist, Alisher Navoi, opened in November 1947. In the mid-1930s, there was no Uzbek architectural experience in constructing large public buildings and a USSR-wide competition was held to build a major theatre and musical performance space. The winning design was by Aleksei Viktorovich Shchusev, a much-acclaimed Russian architect who had designed Lenin's mausoleum. Shchusev's design incorporated Uzbek traditions as well as modern practices. Masters from the six regions - Tashkent, Bukhara, Samarkand, Khorezm, Ferghana and Termez - were engaged to design the six lateral halls to reflect the country’s architectural glory. For example, the Khorezm Hall has carved panels of ganch, repeating the remarkable decorative woodcarving characteristic of Khorezm. 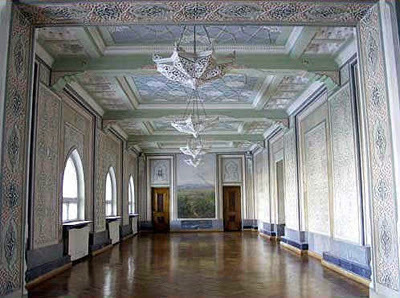 The halls and foyer of the theatre are decorated with murals depicting plots from Alisher Navoi's poems and representing the landscapes of Uzbekistan. Work began in 1939 but was interrupted in 1942 because of the Great Patriotic War. In 1944 construction restarted and in November 1945 Japanese prisoners of war from the Kwantung army were deported to Tashkent to finish the construction. After opening, it has been the venue for remarkable ballet, opera, and musical concerts. International opera festivals are regularly held there. As well as performances of operas and ballets from the classical repertoire, Uzbek composers wrote distinctly Uzbek operas based on folk stories and the poems of Alisher Navoi. These includeTolibjon Sadikov’s Leili and Mejnun and Gulsara, Zainab and Omon. Musicians playing Uzbek instruments formed part of the orchestra of these pieces. 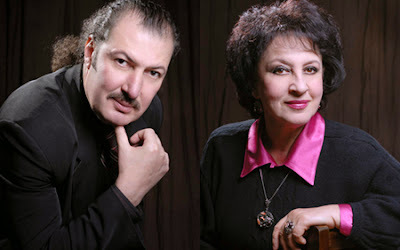 Uzbek language versions of Tchaikovsky’s The Queen of Spades and Eugene Onegin were also performed. Uzbek choreographers have created their own works, developing new forms through a synthesis of classical and traditional dance. Amulet of Love, Poem of Two Hearts, and Tomiris are examples of these ballets. One of the most popular is Guliandom (1940) by Vera Gubstkaya and Tamara Khanum. Many Uzbek ballet dancers were trained by Moscow’s famous companies and honoured with the title of People’s Artists of the Uzbek SSR, such as Ferghana-born Mukkaram Turgunbaeva. The opera house is now undergoing extensive restoration and will re-open at the end of 2013. In the meantime, the opera and ballet companies perform at the Turkiston Palace. Recently I saw Verdi’s Il Trovatore there, with exceptional performances by Olga Alexandrova as Azucena, Ruslan Gafarov as Count di Luna and the Tashkent Symphony, conducted by Mme Ahmetshina Dilara. You can check the program at http://www.gabt.uz/ then run it through Google translate. Or phone the box office on +99871 233-33-44. Performances start early – around 6:00 p.m.
Update November 2015: The official opening of the renovated opera house is 14 November 2015.